This programme is suitable for Managers, Executives, Supervisors, Technical, Sales, Marketing Personnel, Engineers, Business Professionals, Administrators, Clerks and Secretaries. 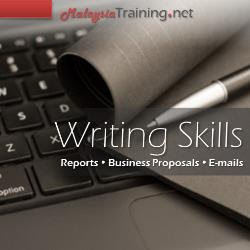 Being able to convey your ideas across to your potential clients or your top management is very much depending on how well you are able to present your proposal using effective writing skill. Examine the need to improve on the standard in writing correspondence that is brief, straightforward and polite. Letters and email that say "yes"
Letters and email that say "no"
This course will be conducted via lectures, individual and group activities, assignment and practical techniques.